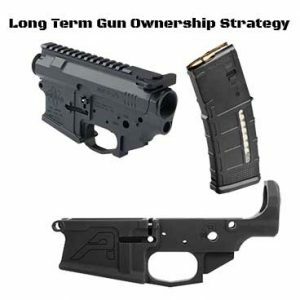 My Long Term Gun Ownership Strategy was not about specifically owning guns for a lifetime it was more about making sure with as much certainty as possible that I would be able to own the guns I wanted and have them as close to as designed as possible without mechanical limitations due to legal restrictions for a lifetime. I determined that my Long Term Gun Ownership Strategy would consist of purchasing critical components over entire weapons. Buying complete weapons would be cost prohibitive. Below is a breakdown of what I decided to do. Understanding full well that the number one target of anti-gun politicians would be “Assault Rifles“. It was clear that the first part I needed to purchase lower receivers which are the part that must be registered. Generic and Milspec was the way to go with AR15 LOWER RECEIVERS. CMMG and Spikes Tactical were what I stocked up on. They were readily available from Brownells which as a site supporter is a bonus.In both cases I also purchased the matching AR15 STRIPPED UPPER RECEIVERS. The reason I say stay with generic and milspec is simply for compatibility. These days AR15 manufacturers attempting to differentiate themselves from the competition are incorporating artistic variations on the platform. Nothing wrong with that until non standard AR15 parts are required to keep the gun working. Keep it simple and keep on shooting. Today I would without hesitation purchase the AERO PRECISION AR15 hardware. Naturally AR15 “HIGH CAPACITY MAGAZINES” are also targets of the anti-gun politicians.I would venture a guess and say 50 percent of my AR15 magazines consist of Brownells branded and Magpul PMAGS. Twenty Five Percent of my AR15 magazines are from D&H. I like the D&H, they work great and are reasonably priced. The remainder of my magazines are an assortment of no name GI magazines and Colt which I owned prior. Just as a sidebar HK (Heckler&Koch) have whats considered to be the best AR15 magazine ever produced. I own several and they function flawlessly and their quality of construction is exactly what you would expect from HK. The price is also what would be expected from HK. 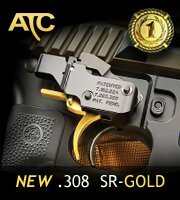 Consider that you might one day want pistol caliber AR15 rifles, SBR’s et cetera. Personally I built a 9mm AR15 and a .45acp AR15. The ..45 AR15 uses proprietary Olympic Arms magazines while the 9mm AR15 used standard Colt 9mm Carbine AR15 magazines. I made sure to have enough magazines. My only option was to purchase a complete AR-10 directly from Armalite. Already living in a ban state without a “grandfathered” AR-10 I ended up buying an Armalite AR-10 A4 10A4CF. Armalite does offer AR-10 STRIPPED LOWER RECEIVERS and under the previous ownership always tried to have some available for purchase. Today under new ownership I believe the AR-10 LOWER RECEIVERS are available when complete rifle production can spare them. My Armalite AR-10 A4 10A4CF does not utilize and 3rd party magazines. 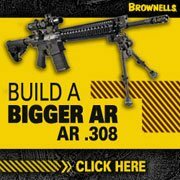 If Armalite does not have stock drop us a line and I can share where Armalite sent me for AR-10 magazines during the shortage a couple years back. At the time the choices that exist today did not exist. For compatibility the safe 308AR LOWER RECEIVER purchases were DPMS, SI DEFENSE and FULTON ARMORY. Today I would still look towards FULTON ARMORY and I would also add MEGA ARMS and AERO PRECISION to the list. I would also suggest buying the 308AR receivers as a set. There are simply too many variations to chose any other path. In the future if your looking for additional 308AR upper receivers by all means do your homework and understand what exactly your lower is compatible with. Note: There are a lot of great 308AR rifles/receivers out there and Im not discounting any manufacturer. My line of thinking is what designs and styles are the most basic and common and should remain that way for years to come. We are not discussing building a complete rifle now. We are discussing pulling a 308AR receiver set from the safe in 10 years and building it up. Then possibly building additional uppers. By all means do what you want. Some semi-automatic rifle designs are not modular and interchangeable like AR15, AR-10 and 308AR rifles. This is an area where you should dig deep in to your wallet and purchase a complete rifle. In my case I purchased an FN FS2000 BULLPUP. In hindsight I wish I also purchased a FN PS90, BUSHMASTER ACR and a FN SCAR. If a rifle you desire requires proprietary magazines be sure to acquire them as well, particularly full capacity versions. My feeling with bolt action rifles is that they would be further down the anti-gun action list at a time when they decide nobody needs a “Sniper Rifle“. The exception being the newer “Modular Rifles” that often share some common features of an AR-10 and AR-15. These features are typically buttstocks and pistol grips which are two of the hot five buttons of anti-gun politicians. Currently I am devoting time to just such guns from Modular Driven Technologies (MDT) an MDT TAC21 and MDT HS3. Note: Some jurisdictions might consider banning by caliber. Nobody needs a .50 Caliber, Nobody needs a “Magnum” anything. I can just hear it on the evening news. Shotguns are probably the low point and last for the gun grabbers. However with that said today their are AR15 styled shotguns and most if not all are imported and can be blocked from entering the USA with the stroke of a pen. Personally for me shotguns never entered into my “Long Term Gun Ownership Strategy” . I have a few and all are good to go. In my opinion handguns are pretty simple to plan on. The first and most important item would be handgun magazines for any pistol you think you might want to own. In my case I order a few variations of Glock, SIG SAUER, CZ, PARA USA and Browning HI Power magazines. In my opinion the biggest risk after magazine capacity would be imported handguns. Like mentioned above anything that can be banned with a stroke of the Presidents pen or without due process should be considered a priority. Very few shooters are made of money and can just buy every gun they want to own in a short period. I suggest coming up with your Long Term Gun Ownership Strategy that works for you. To simplify what was stated above I recommend focusing on the registered part of the gun, magazines and rifles and handguns that can be banned without due process. Lastly do not forget ammunition. Watch for sales. 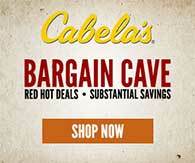 Purchase a box or two of ammunition above what you would normally buy every time you visit the gun shop or Cabelas.